Tammis Keefe. Photo courtesy of Ruth Stone Berg. 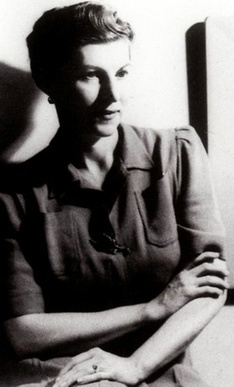 During WWII, Dorr Bothwell and artist friend Tammis Keefe shared a modest apartment in the Montgomery Block, 600 Montgomery Street, San Francisco. At the time, Bothwell was 40 and Keefe was 29. Bothwell began illustrating the diary pages on February 9th, two months after the attack on Pearl Harbor (12/7/1941). 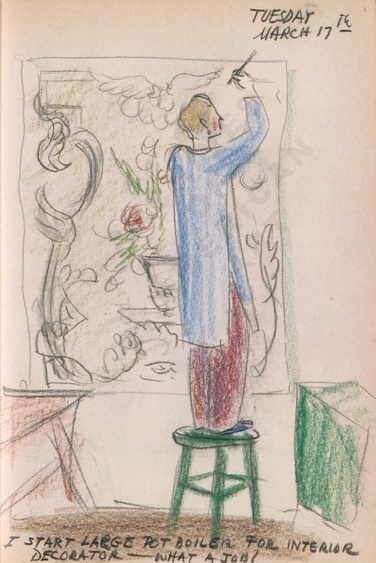 The diary is now part of the Dorr Bothwell papers in the Smithsonian Institution’s Archives of American Art. Monday Feb. 9th. 2:00 am: We set our clock ahead one hour + start ‘wartime’ for the duration. 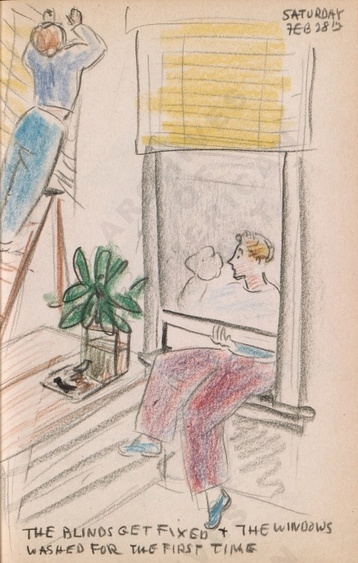 Dorr Bothwell’s illustrated diary (2/9/1942). Archives of American Art. Tuesday Feb. 10th: We trim scrap like mad. 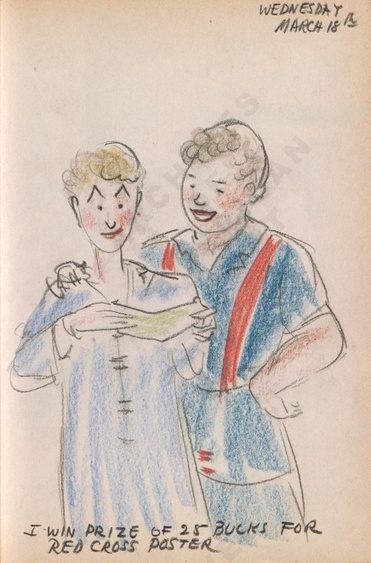 A lovely day – Dorr Bothwell’s illustrated diary (2/10/1942). Archives of American Art. Wednesday Feb 11: The new filing equipment puts the new “National Defense” shoes in the shade. 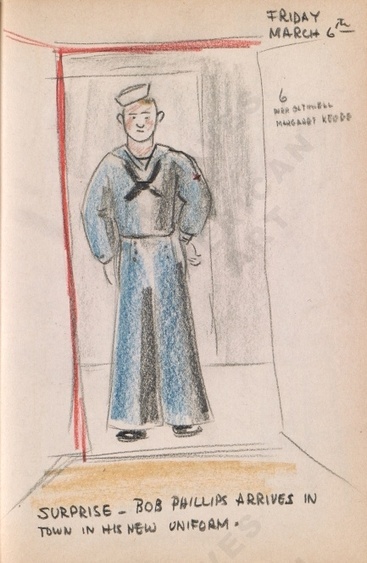 Dorr Bothwell’s illustrated diary (2/11/1942). Archives of American Art. Thursday Feb 12: We take the Greyhound bus to Sausalito + visit Michael + Carl. 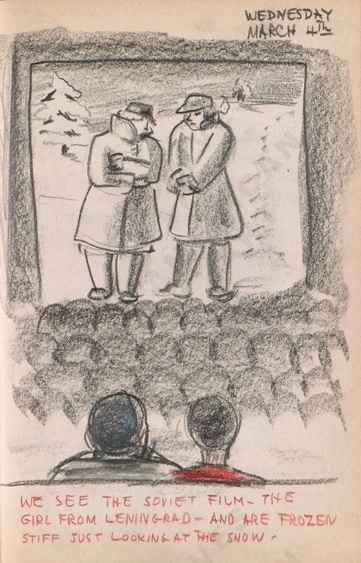 Dorr Bothwell’s illustrated diary (2/12/1942). Archives of American Art. 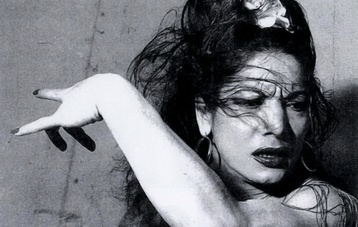 Friday Feb 13: Visit from Vivika + we pan American disorganized efforts. 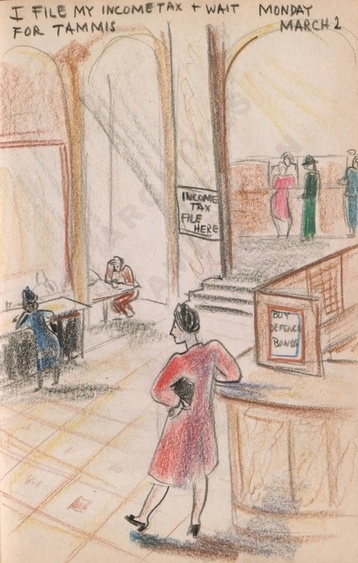 Dorr Bothwell’s illustrated diary (2/13/1942). Archives of American Art. Saturday Feb 14: We suffer through a concert + brother I mean suffer, Janet Graham murdering Chopin – not to mention Prokofief. 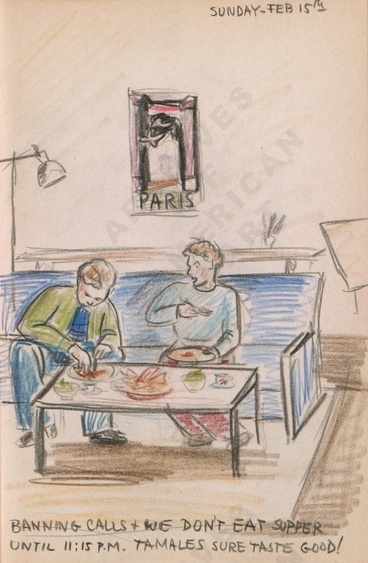 Dorr Bothwell’s illustrated diary (2/14/1942). Archives of American Art. Sunday – Feb 15th: Banning calls + we don’t eat supper til 11:15 p.p. Tamales sure taste good! 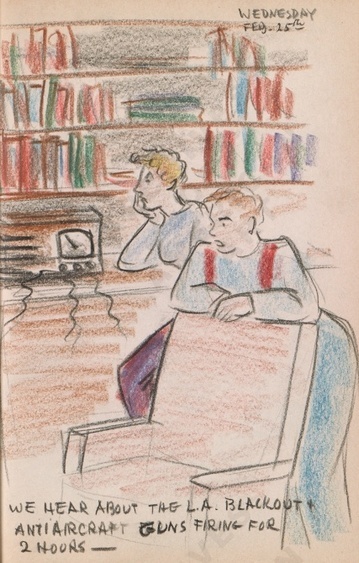 Dorr Bothwell’s illustrated diary (2/15/1942). Archives of American Art. Monday Feb. 16th: We go to Ruth’s and we listen to a lecture by an earnest AWVA on incendiary bombs – Dorr Bothwell’s illustrated diary (2/16/1942). Archives of American Art. Tuesday Feb 17: I attend a very uninteresting meeting at Vivika’s – Vivika + Mallette Green play chess while waiting [Ray Bether in chair]. 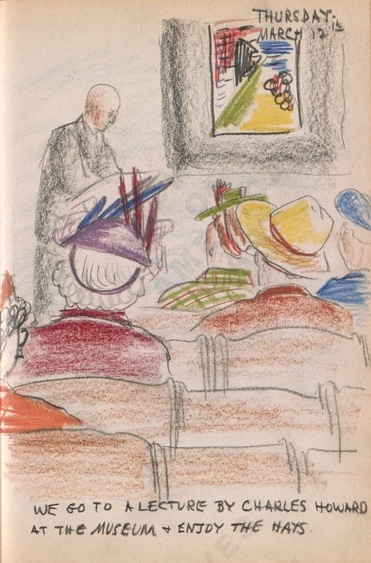 Dorr Bothwell’s illustrated diary (2/17/1942). Archives of American Art. Wednesday Feb 18th: Ouch! Ouch! We have a 19 min. blackout. Hurry up and turn out the stove – its the blackout siren! 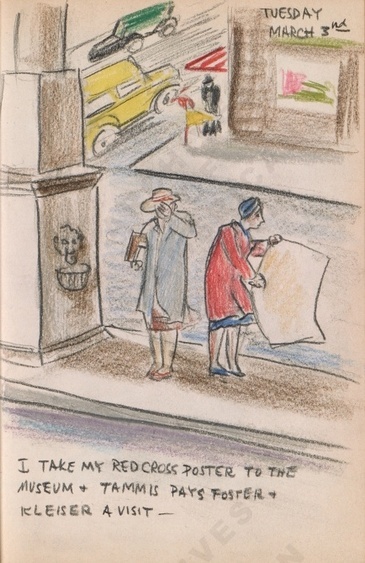 Dorr Bothwell’s illustrated diary (2/18/1942). Archives of American Art. 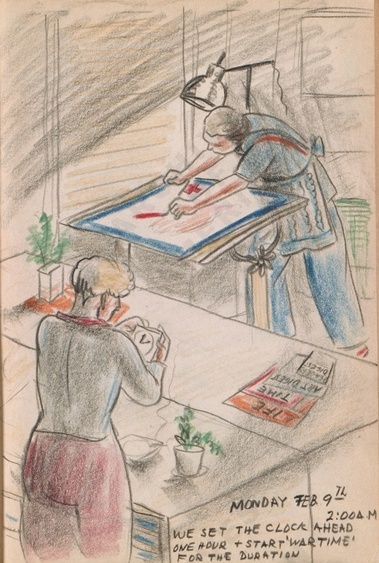 Thursday – Feb. 19th: Tammis lightproofs our bedroom ready for blackouts – Dorr Bothwell’s illustrated diary (2/19/1942). Archives of American Art. Friday Feb 20th: We take in an exhibition at the museum. 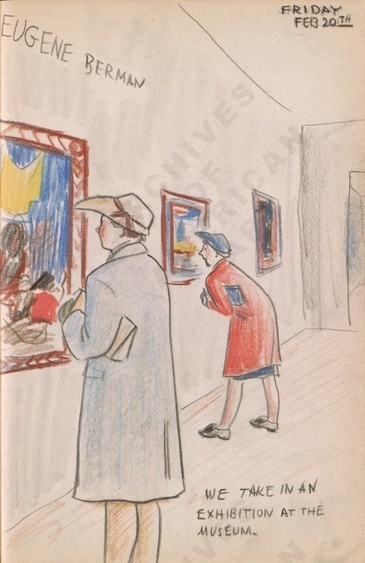 [Eugene Berman (1899-1972), a Touring Retrospective organized by Institute of Modern Art, Boston (1941-1942) ] Dorr Bothwell’s illustrated diary (2/20/1942). Archives of American Art. 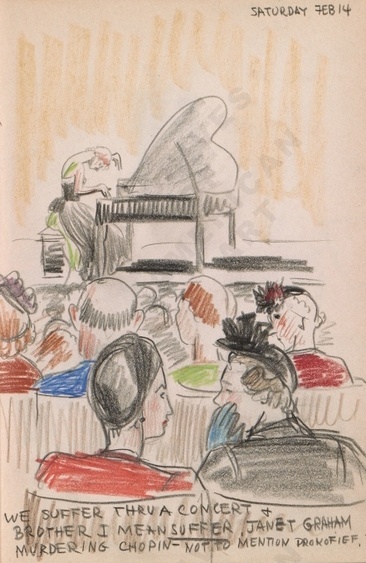 Saturday Feb 21: We hear Jakob Gimpel for the first time – a symphony at the Opera House – Dorr Bothwell’s illustrated diary (2/21/1942). Archives of American Art. 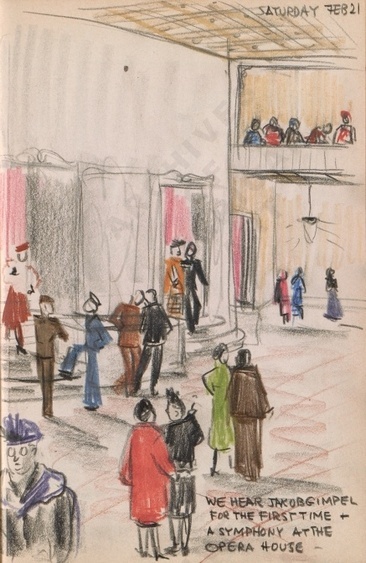 Sunday Feb 22: We add color and glamour to our entry hall – Dorr Bothwell’s illustrated diary (2/22/1942). Archives of American Art. 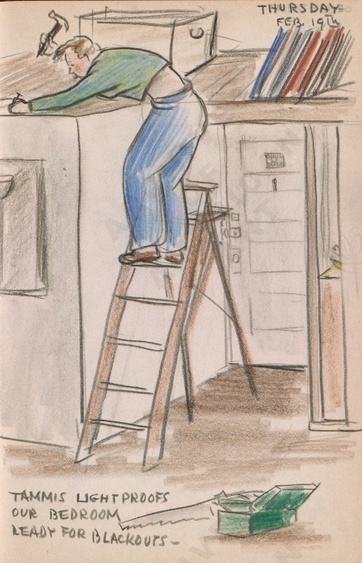 Monday Feb. 23rd: Squire Knowles talks to Tammis while I do drawing for decorator. Dorr Bothwell’s illustrated diary (2/23/1942). Archives of American Art. Tuesday Feb 24th: We go shopping. Tammis get a new turban which she had some difficulty arranging. Dorr Bothwell’s illustrated diary (2/24/1942). Archives of American Art. Wednesday Feb. 25th: We hear about the L.A. blackout + antiaircraft guns firing for 2 hours – Dorr Bothwell’s illustrated diary (2/25/1942). Archives of American Art. Thursday Feb. 26th: We eat supper across the street at the Venitian – [note] company. 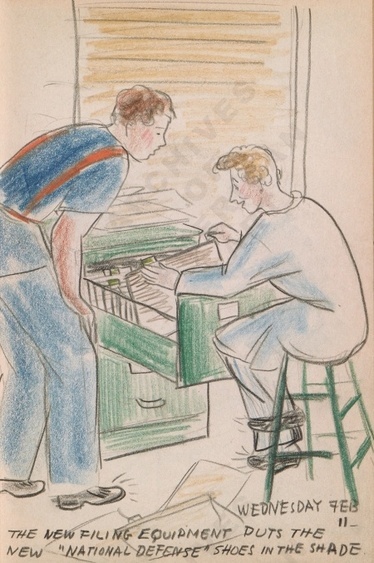 Dorr Bothwell’s illustrated diary (2/26/1942). Archives of American Art. 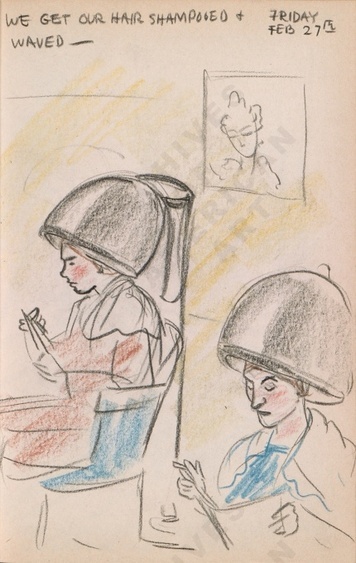 Friday Feb 27th: We get our hair shampooed + waved – Dorr Bothwell’s illustrated diary (2/27/1942). Archives of American Art. Saturday Feb 28th: The blinds get fixed + the windows washed for the first time. Dorr Bothwell’s illustrated diary (2/28/1942). Archives of American Art. 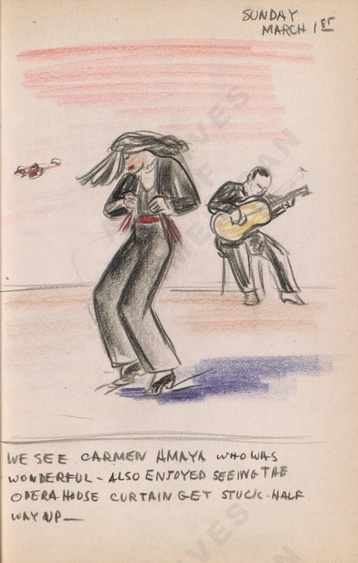 Sunday March 1st: We see Carmen Amaya who was wonderful – also enjoyed seeing the Opera House curtain get stuck half way up – Dorr Bothwell’s illustrated diary (3/01/1942). Archives of American Art. Monday March 2: I file for my income tax + wait for Tammis. 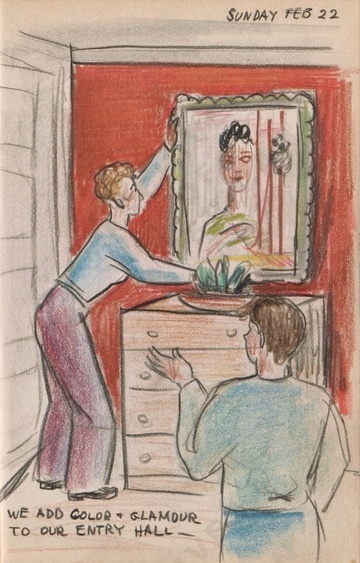 Dorr Bothwell’s illustrated diary (3/02/1942). Archives of American Art. Tuesday March 3rd: I take my Red Cross poster to the Museum + Tammis pays Foster + Kleiser a visit. 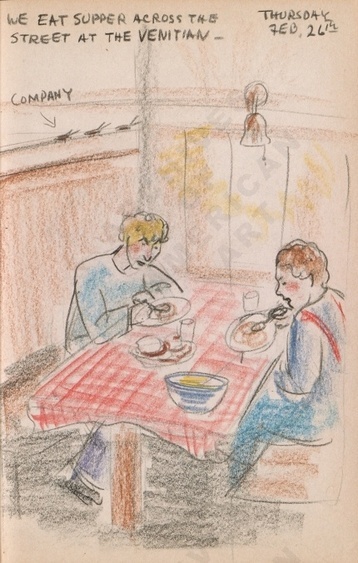 Dorr Bothwell’s illustrated diary (3/03/1942). Archives of American Art. Wednesday March 4th: We see the Soviet film – The Girl from Leningrad – and are frozen stiff just looking at the snow. 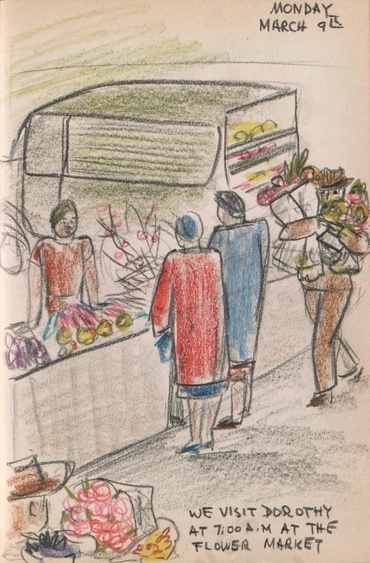 Dorr Bothwell’s illustrated diary (3/04/1942). Archives of American Art. Thursday March 5th: Oh happy day! 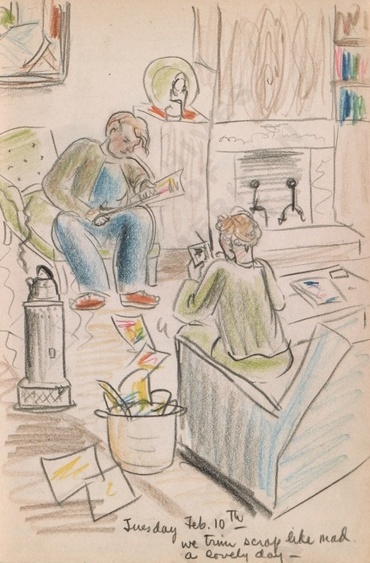 – My beautiful tubes of paint arrive – hand ground by Mr. Pottinger – Dorr Bothwell’s illustrated diary (3/05/1942). Archives of American Art. Friday March 6th: SURPRISE – Bob Phillips arrives in town in his new uniform. 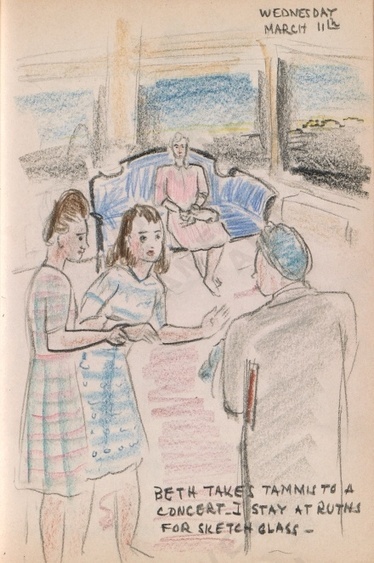 Dorr Bothwell’s illustrated diary (3/06/1942). Archives of American Art. 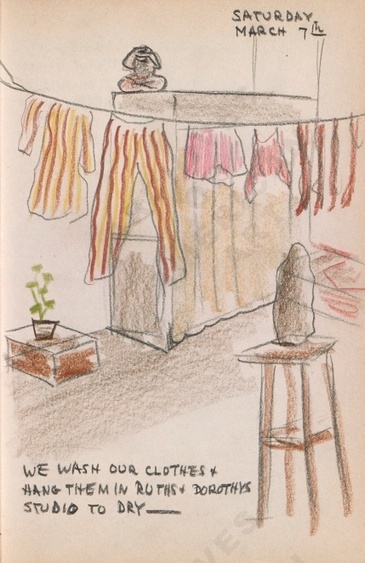 Saturday March 7th: We wash our clothes + hang them in Ruth’s and Dorothy’s Studio to dry – [Ruth Cravath and Dorothy Wagner Puccinelli] Dorr Bothwell’s illustrated diary (3/07/1942). Archives of American Art. Sunday March 8th: I iron while Tammis starts pulling her filing system to pieces. 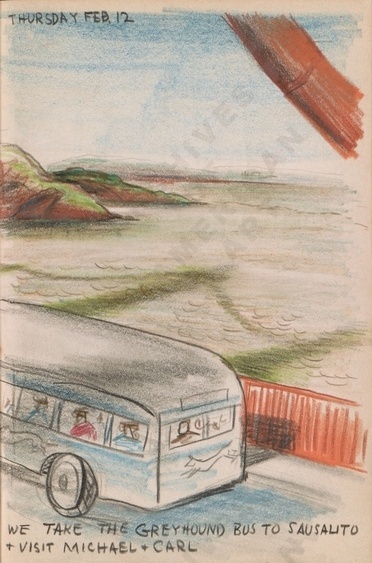 Dorr Bothwell’s illustrated diary (3/08/1942). Archives of American Art. Monday March 9th: We visit Dorothy [Dorothy Wagner Puccinelli] at 7:00 a.m. at the Flower Market. 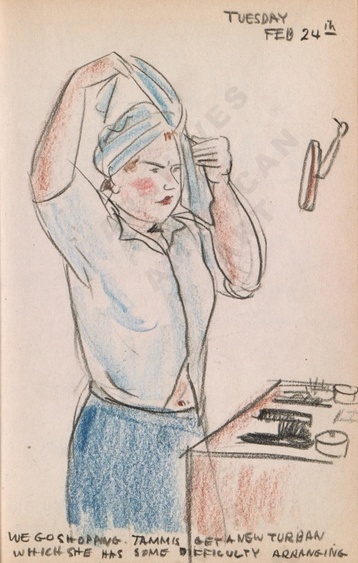 Dorr Bothwell’s illustrated diary (3/09/1942). Archives of American Art. 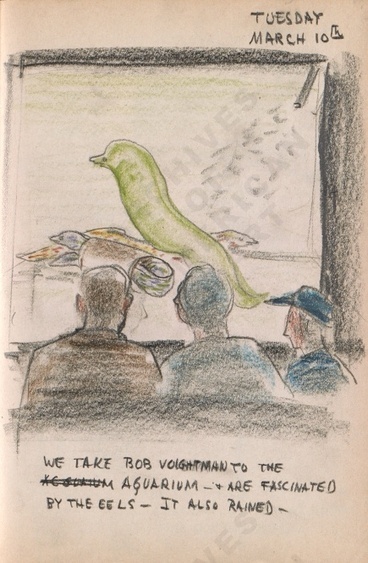 Tuesday March 10th: We take Bob Voightman to the Aquarium – + are fascinated by the eels – It also rained – Dorr Bothwell’s illustrated diary (3/10/1942). Archives of American Art. Wednesday March 11: Beth takes Tammis to a concert. 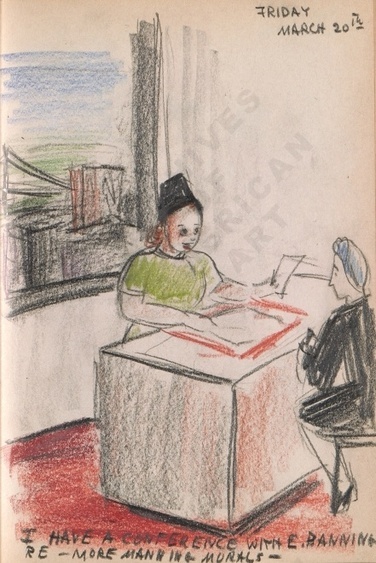 I stay at Ruths for a sketch class – [Ruth Cravath had a studio where she taught classes on the 4th floor of the Montgomery Block.] 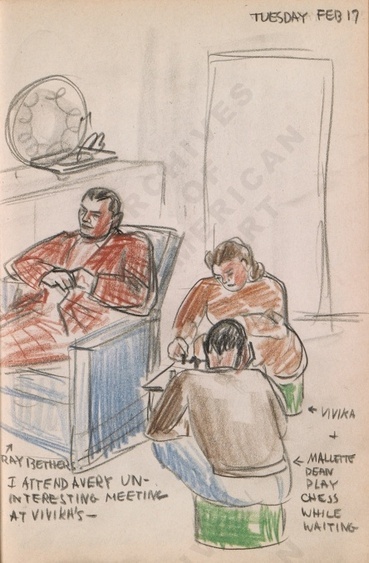 Dorr Bothwell’s illustrated diary (3/11/1942). Archives of American Art. Thursday – March 12th: We go to a lecture by Charles Howard at the Museum + and enjoy the hats. 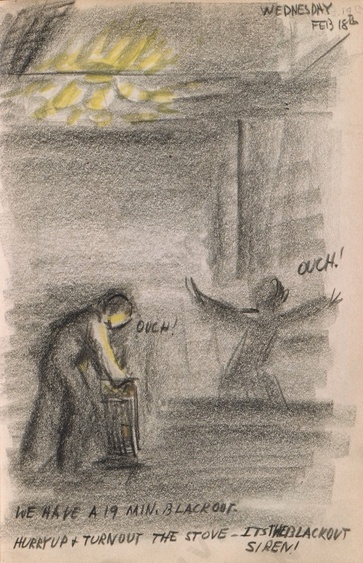 Dorr Bothwell’s illustrated diary (3/12/1942). Archives of American Art. Friday March 13th: We shop as usual in North Beach. 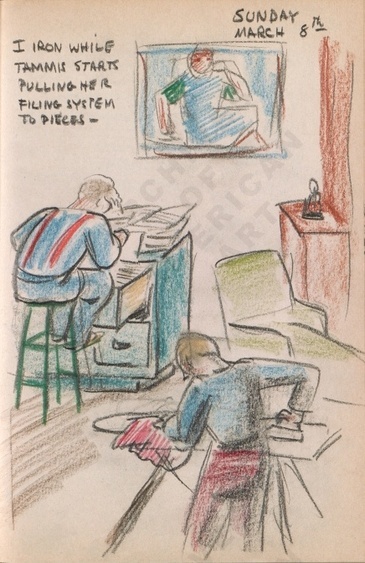 Dorr Bothwell’s illustrated diary (3/13/1942). Archives of American Art. 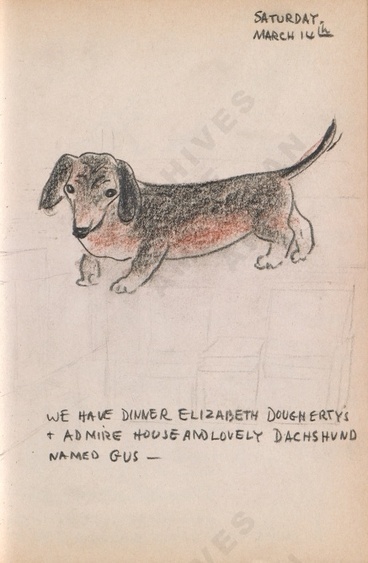 Saturday, March 14th: We have dinner Elizabeth Dougherty’s + admire house and lovely dachshund named Gus – Dorr Bothwell’s illustrated diary (3/14/1942). Archives of American Art. Sunday March 15th: We go to Telegraph Hill to see a large royal lady dock. 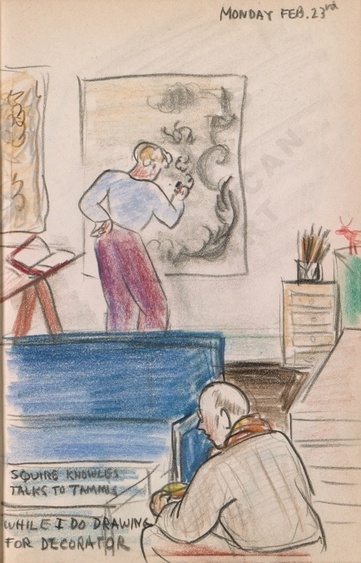 Dorr Bothwell’s illustrated diary (3/15/1942). Archives of American Art. The royal lady was the RMS Queen Elizabeth, joining the RMS Queen Mary in service as a troop carrier after Japan’s entry into the war. 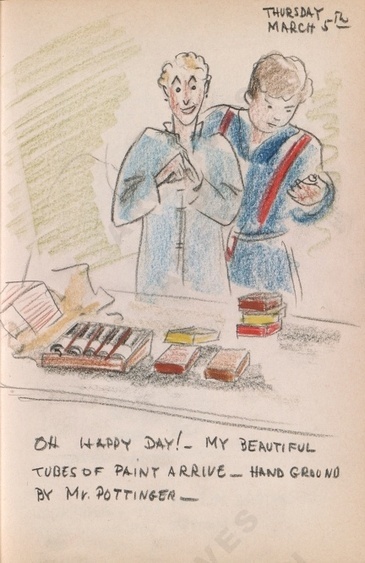 Monday March 16th: I finish a small guache of a mouse & some playing cards – Dorr Bothwell’s illustrated diary (3/16/1942). Archives of American Art. Tuesday March 17th: I start a large pot boiler for interior decorator – what a job! 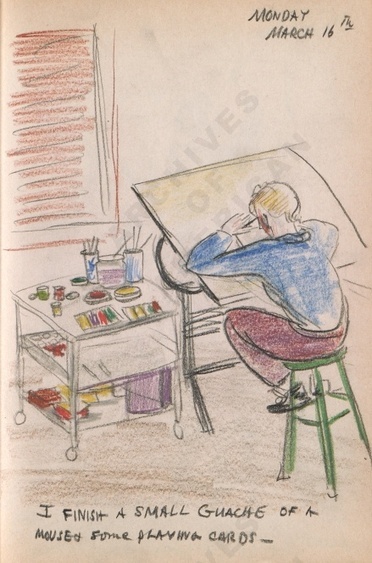 Dorr Bothwell’s illustrated diary (3/17/1942). Archives of American Art. Wednesday March 18th: I win prize of 25 bucks for Red Cross Poster. 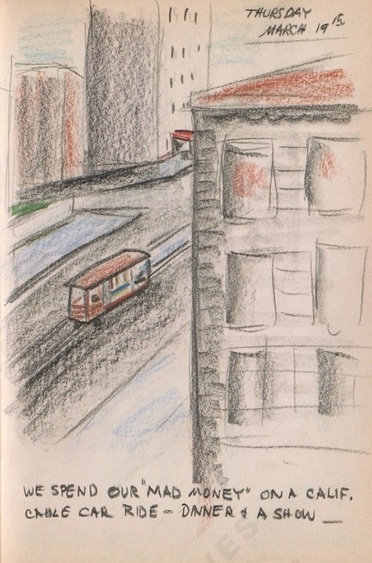 Dorr Bothwell’s illustrated diary (3/18/1942). Archives of American Art. 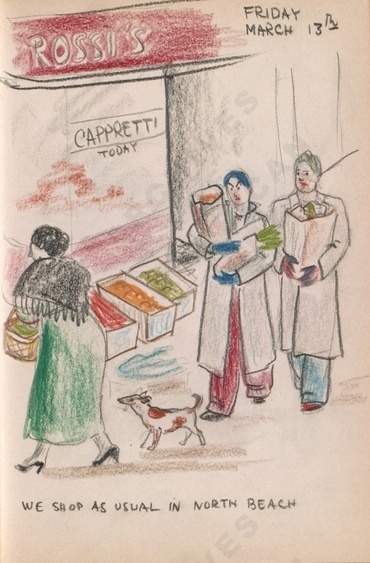 Thursday March 19th: We spend our “mad money” on a Calif. cable car ride – dinner & a show – Dorr Bothwell’s illustrated diary (3/19/1942). Archives of American Art. 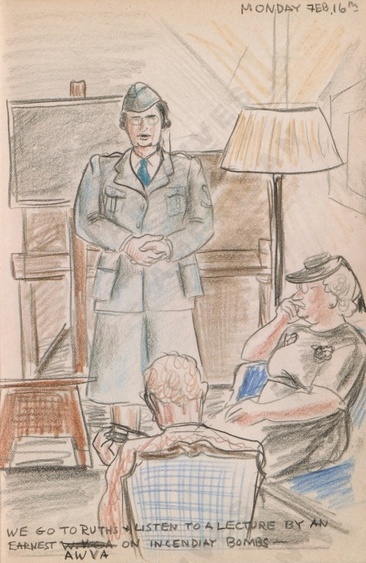 Friday March 20th: I have a conference with E. Banning re – more Manning morale – Dorr Bothwell’s illustrated diary (3/20/1942). Archives of American Art. 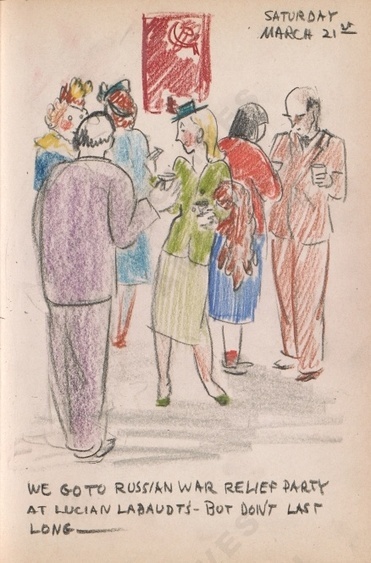 Saturday March 21st: We go to a Russian war relief party at Lucian Labaut’s – but don’t last long – Dorr Bothwell’s illustrated diary (3/21/1942). Archives of American Art. Physical Details: Diary : 1 v. : handwritten ; 18 x 13 cm. [7” x 5”]. 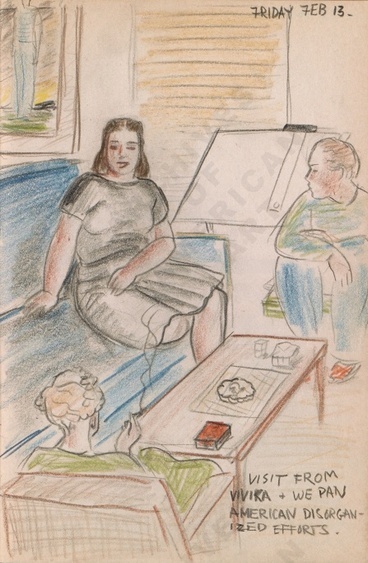 Description: Bothwell gives brief descriptions of her daily life in San Francisco along with a full-page illustration depicting herself and Tammis Keefe in their daily activities. 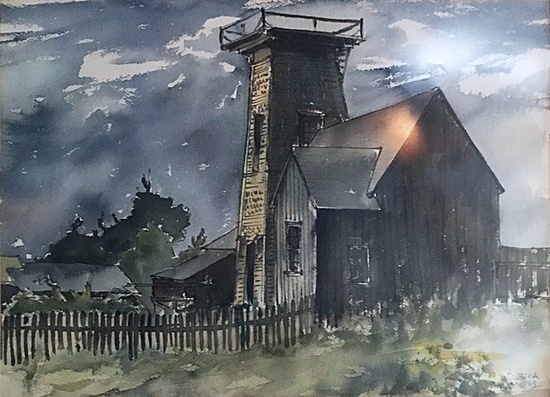 She documents both work (painting, meetings, domestic activities such as grocery shopping, filing, and ironing) and play (going to concerts, movies, and exhibits). 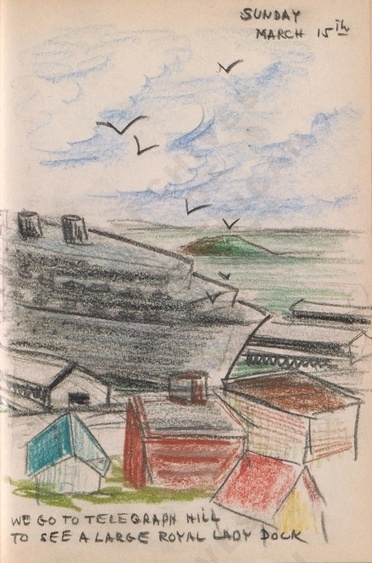 Citation: Dorr Bothwell illustrated diary, 1942 Feb. 9 – Mar. 22. 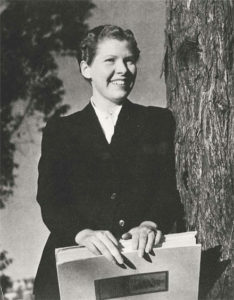 Dorr Bothwell papers, Archives of American Art, Smithsonian Institution.